From "Barney to the "Jesus Cure"
Barney, gentle, generous, modest, honest Barney, he thought, was a really good example of someone who lived in the fruit of the Spirit as described by St. Paul. Quoting Charles Dickens’ famous opening to “A Tale of Two Cities,” Dr. Fontaine reminds us that we are living in the best of times and the worst of times. As charming as the Barney book was, Dr. Fontaine’s latest work is more profound in its spirituality and more practical in how we can apply its Jesus-based moral lessons to our daily lives. Dr. Fontaine explores the roots of our distress and emptiness, and presents the four keys that Jesus used to live a life of integrity, significance, and peace. His “little book,” as he describes it, can be easily summarized in three words: God, others, self. It is, rather, exciting and very enriching. And it provides us with a simple yet effective way of living that can break “Satan’s sword,” Dr. Fontaine’s apt definition of moral relativism. To Kevin Fontaine, Johns Hopkins psychologist, St. Clare, Essex, parishioner, and self-styled Christian writer, moral relativism is the latest and perhaps the most dangerous “virus of self-absorption” in the history of mankind. Put simply, moral relativism posits that there is no such thing as right and wrong; everything is permissible provided we believe that it is right for us. Of course, it increases personal freedom but unbridled personal freedom; freedom without a conscience, freedom without regard for how what we do affects others. Just watch any television sitcom or reality show, says Dr. Fontaine, and you’ll see traces of moral relativism, total disregard for standards of right and wrong. How is Jesus the cure? “Jesus’ life and earthly ministry provides a model of how we should strive to live,” Kevin explained. “His life was the antithesis of moral relativism. Jesus lived his life with a clear moral compass – there was right and there was wrong. His operating principle was love. But love didn’t mean ‘anything goes.’ Jesus’ example prompted those around him to become more fully human, more integrated, and more morally accountable. You need to read Dr. Fontaine’s book to discover exactly what the four keys are, but it’s important to know that they are interlocking and build upon each other. That is, the first key provides the foundation and each subsequent key builds on the previous one until you’ve got four interlocking and interacting keys that, if practiced consistently will, “help you forge a life that smolders with integrity, significance, and peace,” Dr. Fontaine said. Does that mean that if we practice the four keys we can be like Jesus? Yes and no, Dr. Fontaine said. Yes, if we could practice them day in and day out. But that’s a big if. Because we’re fallible human beings we cannot practice the four keys with the sort of regularity that would make us anything like Jesus. We’re flawed. We’re sinners incapable of practicing the four keys in the way Jesus did. What Dr. Fontaine offers us with his four keys is a guide and a standard with which to measure our conduct. “Although we’ll never be exactly like Jesus, at least we’ll have a better sense of what made Jesus the most mature and integrated human being to ever walk the earth,” Dr. Fontaine said. 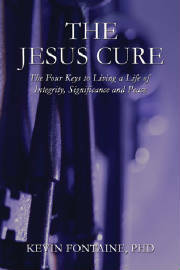 If you’re interested in getting a copy of Dr. Fontaine’s book, you can call 301-695-1707 or go onto the internet at http:www.thejesuscure.com or http://PublishAmerica.com.